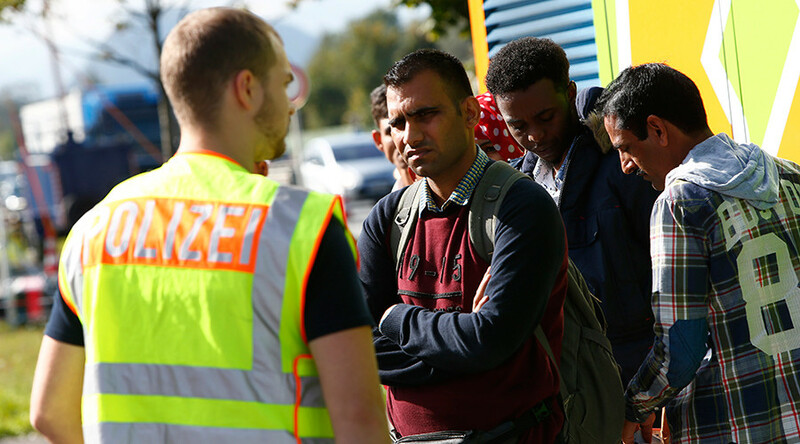 The German state of Bavaria has threatened to file a constitutional complaint against the federal government unless it implements efficient measures to curb the influx of refugees. The Bavarian government has stepped up pressure on Angela Merkel’s’ cabinet, demanding that the German government drop its policy of welcoming an unlimited number of refugees. If “effective measures” are not taken to deal with the crisis, Bavaria will take the matter to the Constitutional Court and charge the German government with endangering “the legal capacity of the German states to act independently,” Bavarian Interior Minister Joachim Herrmann announced after an emergency meeting of the Bavarian government on Friday. “One [the German government] does not comply with the law and the other [Bavaria] wants the law to be complied with,” Bavarian Prime Minister Horst Seehofer said, commenting on the decision at the press conference following the meeting. The Bavarian government is also demanding that Berlin and EU authorities ensure the consistent compliance of all EU member states with the Dublin agreement regulating issues of sheltering. According to this agreement, the EU country to which refugees first arrive, or which first registered them as asylum-seekers, should take them in. “If respect of EU standards as set out in Dublin and Schengen is not restored immediately then the German government must take the decision to turn away refugees at the border,” Joachim Herrmann elaborated on the demand. In his speech at the Munich press conference, Horst Seehofer repeatedly stressed the necessity of limiting the influx of refugees into Germany. Seehofer also invoked security concerns, saying that stemming the incoming tide of refugees would help to “ensure the domestic security [in Bavaria],” emphasizing that he was referring primarily to “criminality in the widest sense,” rather than terrorism. Another measure envisages limiting the right of family reunification for asylums seekers. Herrmann also urged the German government to reinstate border controls with all neighboring countries. This program would include an initiative to create 60,000 new jobs by 2019, including 3,700 new jobs within Bavaria’s police, justice system, administration, and school system. The first 20,000 should be available by 2016, according to the plan. Additionally, the state plans to finance the construction of 28,000 new apartments that could be used as social housing by 2019. However, Horst Seehofer said that the announced measures, including filing a lawsuit with the Constitutional court, would only be implemented if the German government failed to take steps to tackle the refugee crisis. He also gave no details concerning the timeframe in which the German government would have to meet the demands of the Bavarian authorities. Bavarian authorities do not appear to be alone in their discontent with the German government, as the right-wing ‘Alternative for Germany’ party (AfD) announced on Friday that it was going to take German Chancellor Angela Merkel to the court on the charge of “people smuggling” for welcoming thousands of refugees to the Germany. The anti-immigration party claimed it would file a lawsuit with the Berlin public prosecutor’s office requesting that it open preliminary proceedings against the chancellor. “Angela Merkel has operated as a smuggler,” deputy party leader Alexander Gauland said, as quoted by Reuters. “Germany’s absorption capacity has been exceeded,” AfD leader Frauke Petry said. According to the Bavarian prime minister’s office, which is called the Bavarian State Chancellery, about 241,000 refugees have arrived in Germany since the beginning of 2015 through Bavaria alone, although the ministry of migration and refugees claims the total number of asylum seekers entering Germany as a whole during that period is lower, amounting to about 218,000 people. A bit less than 630,000 refugees already lived in Germany in 2014. About 20 percent of the refugees that have come to Germany are Syrians, with about 18 percent coming from Kosovo and 13 percent from Albania.